So you’ve decided to plant a hedge or screen. 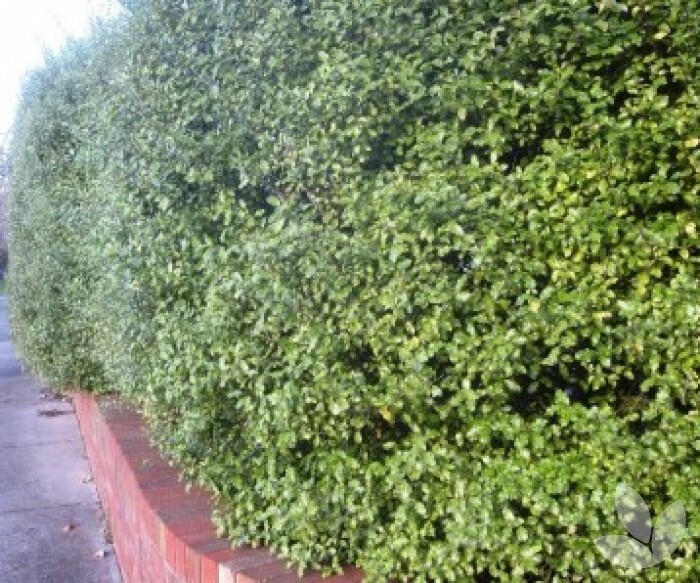 Hedges tend to be a solid structure so you are looking for tightly foliaged trees, often smaller leaved trees that can be clipped easily to shape. The screen is much softer, used for privacy or protection and allowed to grow more naturally according to their own characteristics. Screens tend to be taller only because the effort to clip way up high can be a bit of a challenge. Having said that, the visual grandeur of a tall hedge is well worth the trouble. If you are planning a low hedge for a garden or driveway border, and you are using smaller 14cm or 20cm pots, we suggest planning 5 to the metre. 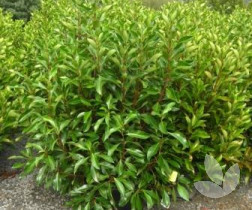 The types of suitable specimens include English Box, Westringia and a ripper plant called Syzygium australe ‘Opal Maze’. Great hedging lines are ones which are dressed all the way to the ground. They grow thick and dense, so that when clipped you get that solid structure at the height you desire. For smaller growing trees and shrubs we can generally apply a 3:1 rule. This represents the height you want your hedge to grow to x width apart. if you want a clipped 3m tall hedge, plant material 1m apart. If you want a 4 metre hedge, plant 1.3m apart; if you want a 2m tall hedge, plant out at 60cm apart. It can get a little trickier with larger material and spacing will depend on the variety you choose. Knowing how tall your specimen grows to is the key. For more information, Planting Tips for Hedges may assist you. 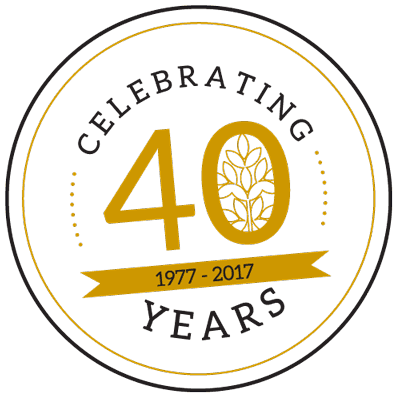 If you have any questions, contact us directly. 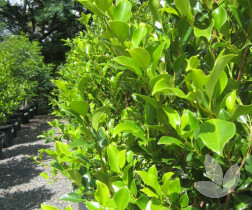 An attractive compact shrub with bright and rounded glossy green leaves. It is a smaller leaf Syzygium producing a greater foliage volume. We have found this to be a great selection for hedging along paths, garden edging and driveways. Suitable for topiary specimens. If using 20cm stock we suggest planting 5 to the metre. For specimens a little bigger at 30cm, we suggest 3 plants to the metre. Great numbers in both sizes are available now. This is a fast growing shrub/small native tree with a slightly broader leaf than straight Acmena smithii and a semi pendulous, dense growth habit to ground level. 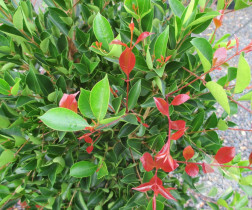 The new growth is glossy and copper red in colour, maturing to mid green. Growing to 6 metres tall, plant 2 metres apart. If you want a 4 metre tall hedge, plant material 1.3m apart. It's easily clipped to the height required. Available now in 30cm and 40cm containers. 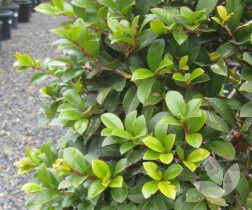 As the name suggests, this is a narrow growing Syzygium that is ideal for narrower places. Or you could use them to great affect like pencil pines, down a driveway or footpath. Growing 6 metres tall and 1 metre wide, i.e. more upright than out, you will need to plant these no more than a metre apart, closer if you are in a hurry! This tree is very popular for its thick foliage and suitability for instant hedging and screens. A small fast growing tree to 8m it has bulk and presence. 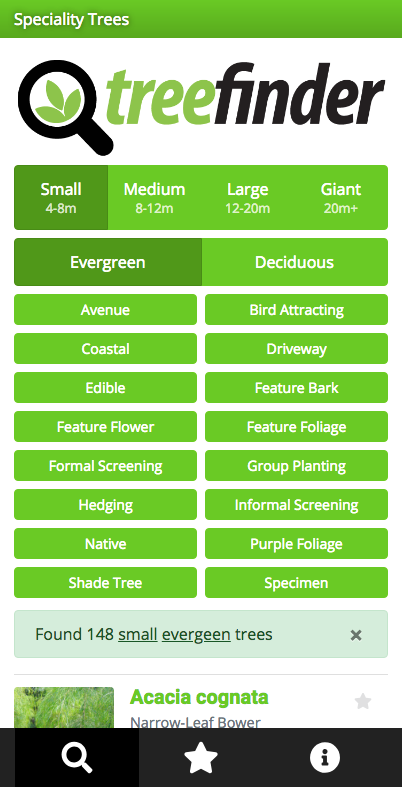 Foliage consisting of different shades of green makes it a favourite among many landscapers. If you want maximum height at 8m, plant material 2.5m apart; for a 5m hedge, plant 1.6m apart, using the 3:1 rule. We have stock available 20cm, 30cm and 40cm. This is a smaller shrub/tree growing approximately 3-4 metres tall. A shapely specimen in the right conditions, its large oval glossy leaves add significant bulk to its form. Fast growing it is perfect for hedging. We suggest planting no more than 1 metre apart for a thick hedge. Available now in 50 litre containers.